Here is a fun craft idea that also makes a great handmade gift for the drink lover on your list. Custom coffee sleeves are much more fun and cozy to use than the paper sleeves given at coffee shops. And, they are a fun way to dress up ceramic mugs. This little luxury is what makes them a great gift items. Plus, this DIY coffee sleeve is super budget friendly because it is made from an old sweater! 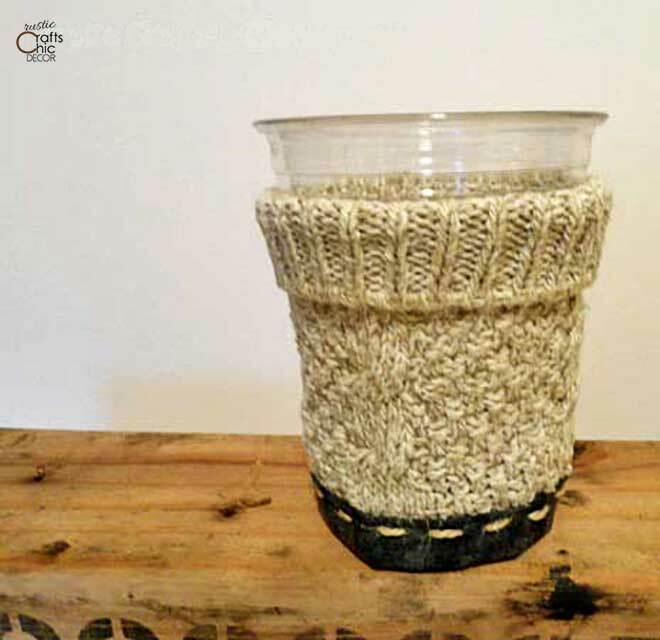 Because you can recycle an old sweater for this easy DIY, the project is both budget friendly and green. A sweater that has shrunk, is stained, or is stretched out can be given new life by using the good parts. The cuffs may be in perfect condition making them ideal for a DIY coffee sleeve. Using recycled materials in a craft is twofold. You are helping the environment by eliminating waste and you are using no cost materials which save you money. An ideal situation! Follow these easy steps to make a custom coffee sleeve of your own. Before beginning, realize that the weave of your sweater fabric will determine the need for how to finish off the bottom. My sweater had a loose weave so I am showing you how to get rid of that extra bagginess at the bottom. A tighter weave wool sweater may only require a hem at the bottom. 1.Cut the end of a sweater sleeve off of an old sweater about four or five inches long, depending on how you are going to use the sleeve. Four inches is good for a tall coffee cup. Five is good for grande and up and also for a drink thermos. I cut mine at five inches for a grande size but it also easily adjusts to a tall size by making a cuff. 2. 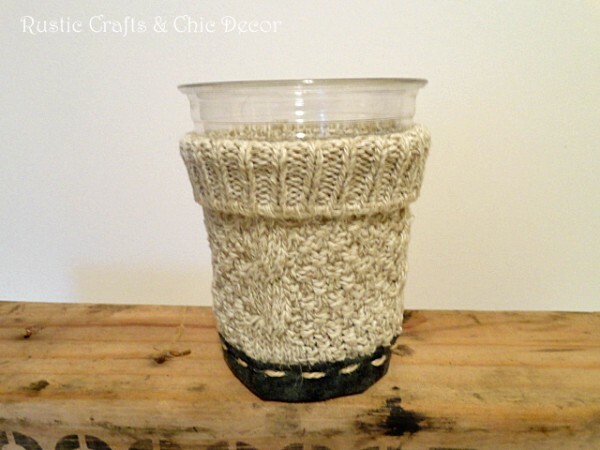 Measure the bottom of your desired cup and cut a piece of elastic or binding that fits around the bottom of the cup just right, do not pull tight. Pin the elastic in place and sew with one stitch across the middle. This is just to give it some extra stability, it won’t be stretchy. 3. To finish off the bottom, you can either sew in a ribbon around the edge or do like I did and sew in a strip of fabric. I finished the edges first by making a seam with two pieces. This way you won’t have any unraveling of material. I could have sewn on the fabric with thread but instead I hand stitched the fabric on with a course hemp string to give a more rustic look. If your sweater fabric is already a tight weave that fits snugly around a cup, just turn the bottom under about a 1/4 inch and sew a hem. 4. The finished product works well for custom coffee sleeves. Again, this craft project is a great way to use recycled materials whether it be old stretched out or shrunken sweaters or gloves that may be missing a mate. There is now no need to throw out these items that aren’t even salvagable for charity! Turn these materials into great looking and fun handmade gifts for yourself or someone you love. Use it at full size for the bottle sleeves or..
fold down the top for shorter coffee drinks!